Get your building’s Life-Cycle Assessment (LCA) done in just one click! The One Click LCA™ plugin delivers instant certification and standards-compliant LCA and LCC results from your Autodesk® Revit® models. One Click LCA™ is an easy-to-use plugin that delivers an automated Life-Cycle Assessment and Life-Cycle Costing from your Revit models. You can use the results to improve your design and to earn valuable certification credits, including LEED v4's MRc1 Building Life-Cycle Impact Reduction, BREEAM Mat 01 Life cycle impacts and many others. All calculations within the software are standard-based and follow a strict protocol. What used to take weeks is now possible in less than an hour with One Click LCA™. The plugin works with structural and architectural models and is able to adapt to your material labeling practices. The cloud service to which the plugin connects detects the materials used in your model and calculates their environmental impacts automatically. Works also without Revit. You can use the cloud service directly or upload data from an Excel, IFC, or gbXML file. Toolkit for certification: In addition of LCA, the cloud platform also supports other materials’ credits as well as Life Cycle Costing and operational performance tracking. The One Click LCA plugin license is included in the license of the One Click LCA web service, which is required. This plugin is not sold or licensed separately. 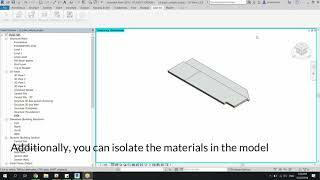 Adds support for Revit 2019 and allows selecting project phase as well as improves the material mapping and result analysis capabilities.